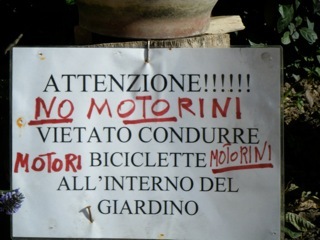 Any motorcycles for sale at motorini? I opened motorini scooters & 'cycles in May 1997 with a view to selling scooters and learner legal motorcycles to the Canberra community. I soon realised that scooters were way more practical for getting around a city, I was enjoying riding them, and the scooter riders were very happy to have someone who focused on their needs. So rather than have a scooter & motorcycle business, we said goodbye to bikes and there haven't been any in the shop this century. Attention it is forbidden to bring bicycles (or scooters) into the garden!